I met my first mango in Taiwan in 1980 and it was love at first bite. Like so much for me in Asia then, a mango was terribly exotic and new. I was floored by its fresh, juicy, tropical taste and loved eating it “inside out”, those luscious orange cubes popping out from a leathery, inverted skin. Mango orchards covered much of Taiwan and small mountains of these fruits used to fill the markets during mango season. On a student budget, this was something I could afford to binge on, but my Chinese Auntie was appalled by my ravenous appetite. I know that Chinese notions of dietary, yin-yang balance are centuries old and very wise but when mango season comes to town, I open wide and gobble up. Every spring in Toronto these yellow, kidney-shaped mangoes called Ataulfo and Alphonso start to appear and I can’t wait to peel off their skin and slice into their rich golden, fibreless skin. Deeply sweet and intoxicating, it’s no wonder Persians named it samarbehist or fruit from heaven. I’m happy to eat it straight for breakfast, or slice it up and toss it into a fruit or green leafy salad. It goes into my Thai mango salad and stars in a salsa (recipe below). 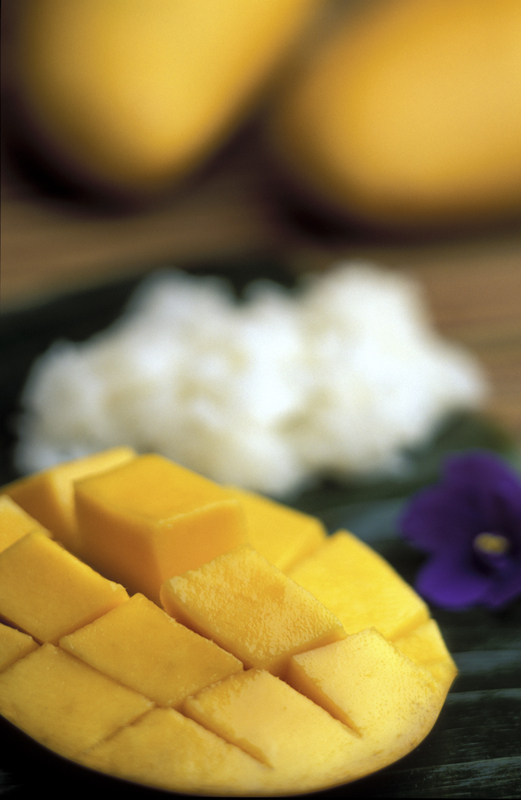 Sometimes I’ll cook up some coconut sticky rice and serve that adorned with thin slices of mango. Nothing beats it pureed into a mango lassi or strawberry smoothie. Besides rocking in the taste department, mango is a nutritional powerhouse, ranked right up there in the top ten list of good-for-you fruits. It’s an excellent source of vitamin A, high in C and a source of fibre, vitamins E and B6. Moreover, it’s bursting with carotenoids (plant pigments) such as beta carotene and zeaxanthin, which protect against cancer, enhance immunity and help to prevent age-related macular degeneration, the leading cause of blindness. 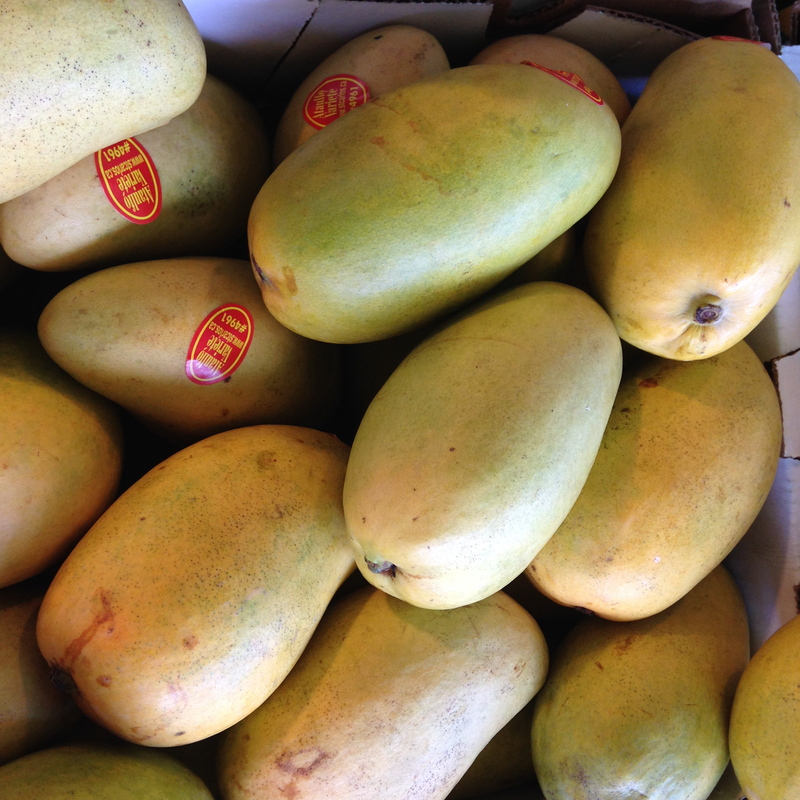 Before Ataulfo and Alphonso entered the market, most consumers were familiar with Haden, Kent or Tommy Atkins mango. These are oblong or roundish, about the size of an adult hand, covered in green skin splashed with red and sometimes yellow patches. They usually weigh about twice that of the smaller yellow ones. It’s good to know that colouring does not indicate ripeness in a mango. How it feels, does. A ripe mango should yield to slight pressure and have the feel of good leather. Sniff around the stem end. A ripe mango will emit an intense, flowery smell. 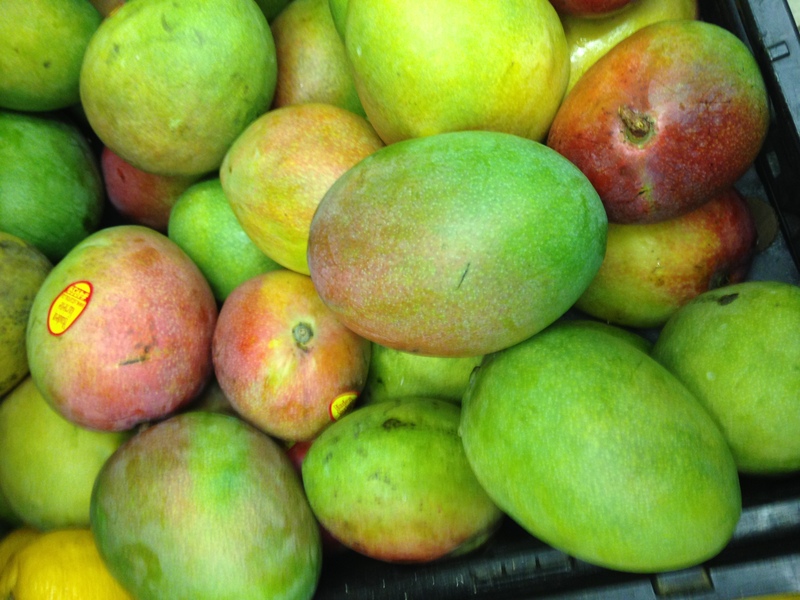 Two new varieties of mango have become available, the big green Keitt from the USA and the Pango Mango from Puerto Rico. Both are large meaty mangoes. The Keitt stays green, even when ripe. And the newly developed green Pango Mango with its reddish blush has no fibre at all. This salsa offers up a quartet of flavours: sweet, sour, salty and hot. It’s a cinch to make and, like most salsas, the flavours intensify if you let it sit in the fridge for a few hours before serving. 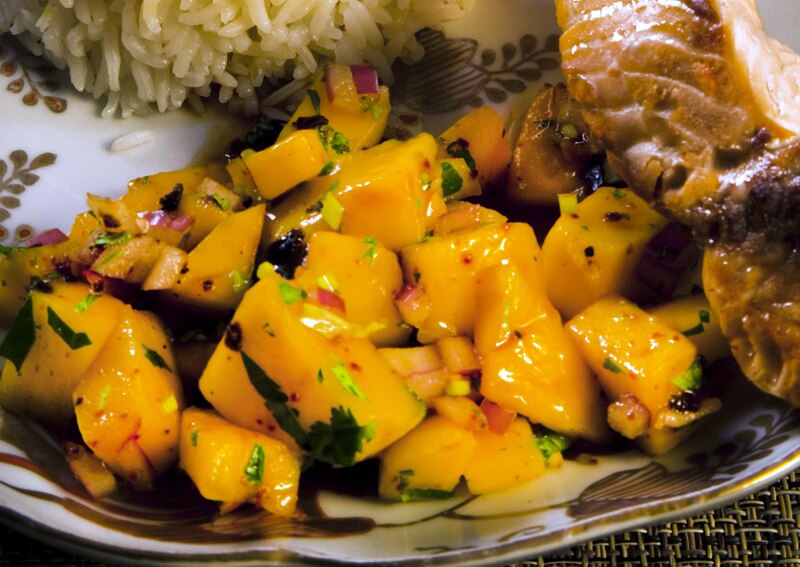 Mango salsa is the perfect counterpoint to grilled poultry or fish, Tex-Mex dishes or even curry served on rice. Be sure to use fully ripe mangoes. In a non-metallic mixing bowl, add the mangoes, red onion, garlic, fresh coriander and lime juice. Dice roasted red peppers if using and add to mixture. Chop dried chili pepper and add to salsa mixture. Salt to taste. Refrigerate for at least 1 hour before serving for best results. Dry-roasting your dried chili peppers helps brings out richer flavours. Plus, it’s simple to do. Either roast it in a dry frying pan at medium heat for a few minutes or until it turns dark brown, or roast it in your toaster oven. It’s easy to burn a dried red chili pepper, so watch it carefully. This entry was posted in Food in my travels, Food talk, Ingredients, Photos by Donald Nausbaum, Photos by Madeleine Greey, Recipes and tagged Alphonso, Asian, Ataulfo, coriander, fruit, Get Fresh!, haden, healthy, Kent, mango, Taiwan, vitamin C. Bookmark the permalink. Mmmmmm, I want this salad now! Sounds delicious. Thanks Georgina, I hope you will try it! Music to my ears!!!!! Thanks Christine. Its no fair that i cant just reach my paw in and grab. drooling. That’s ok- you’ll have many paws full of fresh blackberries in your hood next month!